While the news of Hue Jackson’s firing was a bit of a surprise, it’s not like no one could see this one coming. Let’s connect the dots a little bit. First, Jackson pulled off a rather controversial trade of Carson Palmer, surrendering two high drafts picks to the Cincinnati Bengals in the process. The trade happened after QB Jason Campbell was lost to a season-ending injury after a 4-2 start. Unfortunately for Jackson, the trade didn’t helped as much as he had hoped. The Raiders went 4-5 after the Palmer trade, resulting in a disappointing 8-8 finish. Then there was the “leading the league in penalties again” thing. The Raiders were undisciplined on the field, and it cost them some games. But I believe the tip of the iceberg was Jackson acting as if he was the king of the hill in the organization. 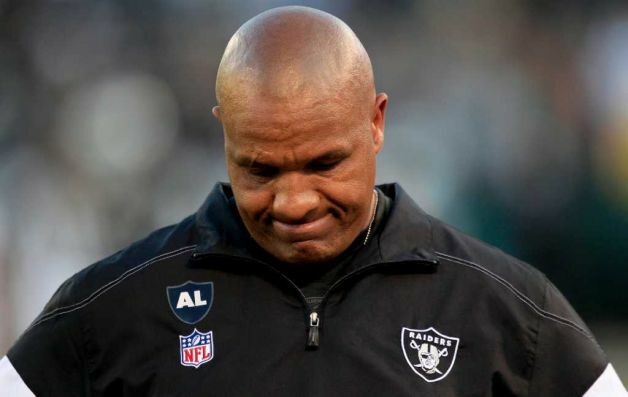 Reportedly Jackson wanted more control over personnel matters since the death of long-time owner Al Davis. Jackson pushed hard for the Palmer trade, and was flexing his muscles just enough for the trade to go through. Enter new Raiders general manager (actually, its first general manager) Reggie McKenzie, a no nonsense kind of brother from the Green Bay Packers’ organization. McKenzie not only wanted his own coach, but knew of Jackson’s drunken-with-power mindset within the organization. So he did what any new general manager would do in that situation, fire the coach and move forward. Jackson was a decent head coach, a bright offensive mind who will catch on as an offensive coordinator somewhere. He just needed a nice helping of humble pie. This may be the best answer I’ve seen to the question “why does Hue Jackson get fired?” That is, other than the new GM just wants to bring in his guy. But there’s another question: Did anybody really expect this team to make the playoffs with that group of quarterbacks? I’m not at all surprised by the firing of Hue Jackson and actually expected it. Tom Cable, the Oakland Raiders’ coach last season also had an 8 – 8 season except he finished on a winning note by knocking off their division rival KC Chiefs in week 17 and finishing 6 – 0 in the AFC West only to lose his job. Why would Hue Jackson except to be given another season?